Food for Thought! : Warren Buffett tells investors ' The party is over'. Warren Buffett tells investors ' The party is over'. 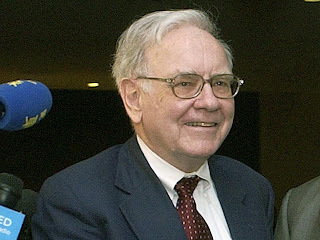 Warren Buffett, the world’s third-richest man, declared that the insurance “party is over”, as his Berkshire Hathaway investment vehicle reported that fourth-quarter insurance underwriting profit fell 46 per cent to $465 million (£235 million), while insurance investment income rose 12 per cent to $978 million. Mr Buffett, who typically makes about half his profits from insurance companies such as Geico and National Indemnity, said that Berkshire Hathaway had been reducing new underwriting as rising competition in the absence of any disaster since Hurricane Katrina in 2005 pushed rates down, especially on coastal properties. He also gave warning that, after two years with no significant disasters, it was only a matter of time before one happened, affecting claims. The decline in underwriting revenues dragged down the group’s fourth-quarter net income from $3.58 billion to $2.95 billion. However, for all of 2007, Berkshire’s profits rose by 20 per cent to $13.21 billion. Mr Buffett, 77, whose Berkshire Hathaway owns 2.9 per cent of Tesco, 4.8 per cent of Coca-Cola and 2.2 per cent of Johnson & Johnson, said that he had drawn up a shortlist of four candidates to succeed him when he finally retires. He would not name names.